Who doesn’t love this ultimate classic dessert? The flaky crust, the scrumptious juicy filling.. A homemade goodness for the whole family! So the idea of a Lenten apple pie, with no eggs, butter or milk was a must try! The tricky part was of course to make the pastry. If you ever tried an apple pie before you must know that butter is an essential ingredient for the dough. For the classic apple pie cold butter is combined with flour to form a wonderfully crumbly flaky crust. Most Lenten apple pies I tried turned out mushy with a strong oily flavour and just when I was ready to admit that no Lenten apple pie will ever come close enough to the real thing, I got my hands on this recipe. After some experimenting I decided to replace some of the oil with orange juice and cognac and regular flour with self rising flour. The result was simply astonishing! For the filling I used earthy Mediterranean flavours; a delicious mix of apples, chopped walnuts, raisins and cinnamon with just a hint of lemon zest. Try to select apple varieties that are in season, as out of season apples may not be as flavourful as fresh picked. (For my apple pies I use a combination of eating and cooking apples, Granny Smith, Honeycrisps, Golden Delicious, Bramley and Braeburn will work out terrific.) Enjoy! To prepare this Lenten apple pie, starting by making the dough. In the mixer’s bowl add the oil and sugar and whisk for 3-4 minutes, until incorporated. Pour in the orange juice and the cognac and whisk for 1 more minute. Add the flour a little bit at a time and mix until the dough becomes soft. Wrap the dough with some plastic wrap and let it rest in the fridge for 15-20 minutes. In the meantime prepare the filling for the Lenten apple pie. Peel the apples and slice them in thin slices. Place the apples in a pan along with the rest of the ingredients for the filling. Heat over medium heat and simmer for 5 minutes, until the apples slightly soften. Dust a clean work surface with flour and divide the dough in two halves. Roll out one piece of the dough until 1/2 cm thick. Roll carefully the dough around the rolling pin and unroll it over your pie dish (approx. 20cm). Ease the pastry into the pan and push it into all the sides. Using a fork to make some holes on the bottom pastry. Fill with the apple filling and squeeze to tight it into the dish. Roll out the other piece of dough (approx. 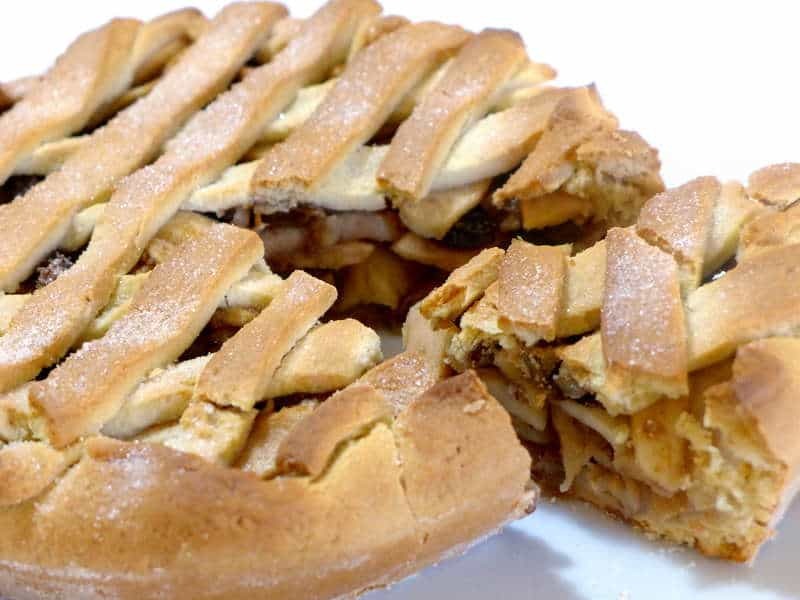 1/2 cm thick), cut into strips and decorate the apple pie, placing them in a latticework pattern, as seen in the picture. Sprinkle the apple pie with sugar and bake in preheated oven at 180C for approx. 40 minutes, until golden. Remove the apple pie from the oven and let it sit for 5-10 mins. Sprinkle with more sugar and serve while still warm from the oven. Enjoy! corn oil is not available here (Spain). What other oil would do? sunflower? grape seed? Please advise. This dough sounds amazing.